You will be familiar with the concept of the curate’s egg. In the original cartoon in Punch, a junior clergyman is pictured having breakfast with his bishop in the dining room of the episcopal palace. The prelate has turned to his guest and enquired, “How is your boiled egg, Mr Smith?” The poor curate, desperate not to upset his host, replies, “It is good in parts, my Lord”. 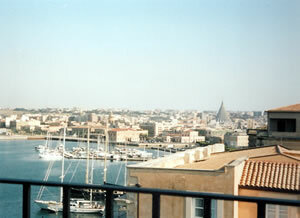 That is how I found my hotel in Siracusa (or Syracuse, as we English used to say). I was attracted to it by its perfect location, on the island of Ortigia – the grand part of Siracusa – and by its delightful name: the Hotel Des Étrangers et Miramare. It was, like the egg, good in parts. Certainly, it looks wonderful, as you can see from my picture – every bit the lofty, aristocratic seaside hostelry, built for persons of means and taste in the 1890s, which I had expected. 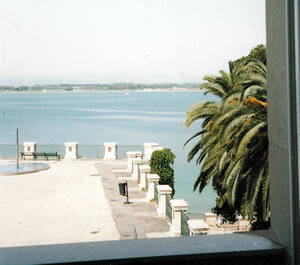 Most of its rooms have a view over the bay (although I suggest you ask for a room on the 4th floor to secure the best outlook) and – just round the corner – is one of the glories of Sicily. During my visit I never tired of the two-minute walk to the Piazza Duomo. This is perhaps the finest square in Italy. The Baroque façade of the cathedral by Andrea Palma (1754) is but one of the many architectural gems which define this lovely space. And behind the cathedral façade is one of the most atmospheric chambers I have ever entered. It claims to be the oldest church in Europe, for it is a converted Greek temple. I found it remarkable to be able to touch the massive fluted columns, carved in Antiquity. I had driven in a hire car to the hotel. This was a mistake. Parking here is extremely difficult and the hotel does not possess any space for motors. A taxi from the airport in Catania would have been much better. The first room I was offered had a shower, but no bath, and I am quite incapable of survival without my daily bathe. The second room had a bath, but – as I discovered after I had unpacked – its air conditioning was not working, and I find cold air essential to combat the Sicilian heat. Third time lucky: room 116 on the first floor was both properly cooled and possessed of a tub. 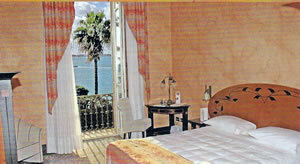 It was a ‘sea-view standard’ and therefore 205-275 euros a night, bed and breakfast for two, according to season. 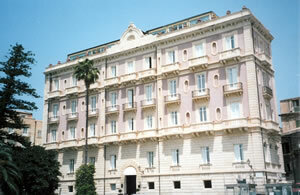 The Des Étrangers is, I think, the most expensive hotel in Siracusa, so prices in these parts may be considered friendly. This room was of modest size, with one easy chair, a floor of dark red tiles, white walls and black wooden furniture. Its décor combined elements of Art Déco and Art Nouveau. The overall effect was clean and functional, but not in any way luxurious. The bathroom was small, with black and white tiles, chrome fittings, one wash basin, a bidet and, of course, the all-important tub. I liked the view from the single window (pictured). I had a little difficulty with the front desk. It took me aback, returning from dinner and finding that my room had not been serviced (after I had specifically asked for the turn-down service), to be greeted with the assertion that this must be my fault because I had probably left the ‘Do not disturb’ notice on my door. I had not, and this exchange did not improve my temper. In contrast, I was impressed by the speed and efficiency of the young fellow who rushed to my room the next day and retrieved – with a giant version of a wire coat hanger – one of my shoes, which had dropped behind the fitted wardrobe. Eating in the restaurant was also a mixed experience. 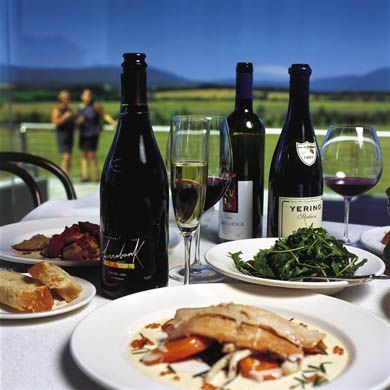 I was surprised to be told, when I sat down for dinner, that there was no wine list. 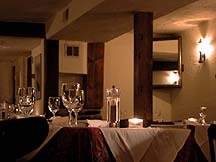 As usual, I drank both white and red wines, but I do not feel able to recommend those bottles which were brought to me. My meal of mozzarella with asparagus, spaghetti with prawns, roast sirloin with new potatoes and lemon jelly with strawberry coulis cost 76 euros. Yet this same dining room became the scene of a real treat for me each morning. Here I experienced by far the most enjoyable part of my stay at the Hotel Des Étrangers et Miramare – indeed, it is the reason why I am able to commend this establishment to you. Breakfast. As you will know, dear reader, I am not one to rush the first meal of the day. I like its ingredients to be plentiful and of the highest quality and I like to consume them in surroundings which remind me of the beauty of God’s creation. Here all was wonderful. I reproduce for you a picture of part of the view from my breakfast table. It does not in any way do justice to the panorama I surveyed from my shaded table on the restaurant terrace. To my left were the sea and the distant hills, with the harbour and its pretty sailing yachts in the foreground. To my right were the roofs of palaces and churches, culminating with the top of the cathedral façade. As the sun shone and the early breeze cooled my face, I thought this must be one of the finest spots I have yet found for the morning repast. Pleasant young ladies brought me pots of coffee and glasses of delicious, freshly-squeezed orange juice, made from the blood oranges of Sicily. (You will need to ask for the latter.) From the buffet I took All-bran, slices of poached pear, bacon and scrambled eggs and croissants. So the best part of the curate’s egg, appropriately, was breakfast. This and its proximity to Siracusa’s Piazza Duomo make the Hotel Des Étrangers et Miramare eminently worth your consideration. Passegio Adorno 10/12, 96100 Siracusa, Sicily, Italy.